Riding in the New Forest National Park. 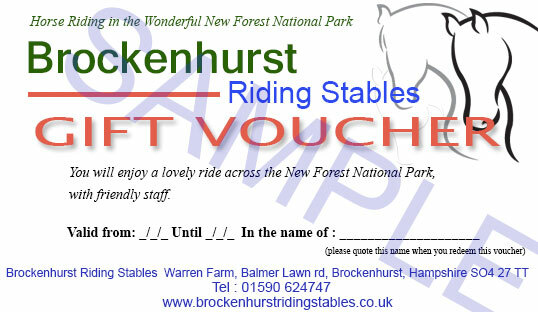 The Brockenhurst Riding Stables gift vouchers make the perfect Equestrian gift. Suitable for all users experienced and total newbies! Vouchers can be purchased at the stables or over the phone with a credit or debit card. Cancellation policy ! We can not accept any cancellation once the non-refundable payment is taken prior to riding. Credit and debit cards accepted.